My final year as a dad of a SPU student and I got to go to the first annual Dad's Only Day at SPU. 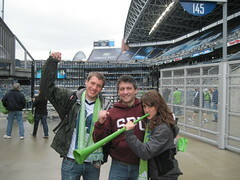 The day's events began with breakfast at SPU and then a trip to the Seattle Sounders game. Markus and I went with Jason and Jillian Shdo. I'm not sure why we let Jill get that obnoxious horn! The rain held off except for a few sprinkles, making for pleasant game conditions. The Sounder fans are great and the game was fun to watch as it was my first pro soccer game. Fortunately, the Sounders scored in the extended minutes of the game to win 1-0. Jack is jealous! What a great game -- worth watching 96 minutes to see the winning score!